Vacuum processing is a maintenance process that facilitates the persistent operation of PostgreSQL. Its two main tasks are removing dead tuples and the freezing transaction ids, both of which are briefly mentioned in Section 5.10. Despite the fact that vacuum processing is essential for PostgreSQL, improving its functionality has been slow compared to other functions. For example, until version 8.0, this process had to be executed manually (with the psql utility or using the cron daemon). It was automated in 2005 when the autovacuum daemon was implemented. Since vacuum processing involves scanning whole tables, it is a costly process. In version 8.4 (2009), the Visibility Map (VM) was introduced to improve the efficiency of removing dead tuples. In version 9.6 (2016), the freeze process was improved by enhancing the VM. Section 6.1 outlines the concurrent VACUUM process. Then, subsequent sections describe the following. Vacuum processing performs the following tasks for specified tables or all tables in the database. Remove dead tuples and defragment live tuples for each page. Remove index tuples that point to dead tuples. Freeze old txids of tuples if necessary. Update frozen txid related system catalogs (pg_database and pg_class). Remove unnecessary parts of the clog if possible. Update the FSM and VM of processed tables. Update several statistics (pg_stat_all_tables, etc). It is assumed that readers are familiar with following terms: dead tuples, freezing txid, FSM, and the clog; if you are not, refer to Chapter 5. VM is introduced in Section 6.2. The following pseudocode describes vacuum processing. (1) Get each table from the specified tables. (2) Acquire ShareUpdateExclusiveLock lock for the table. This lock allows reading from other transactions. (3) Scan all pages to get all dead tuples, and freeze old tuples if necessary. (4) Remove the index tuples that point to the respective dead tuples if exists. (5) Do the following tasks, step (6) and (7), for each page of the table. (6) Remove the dead tuples and Reallocate the live tuples in the page. (7) Update both the respective FSM and VM of the target table. (8) Truncate the last page if the last one does not have any tuple. (9) Update both the statistics and the system catalogs related to vacuum processing for the target table. (10) Update both the statistics and the system catalogs related to vacuum processing. (11) Remove both unnecessary files and pages of the clog if possible. This pseudocode has two sections: a loop for each table and post-processing. The inner loop can be divided into three blocks. Each block has individual tasks. These three blocks and the post-process are outlined in the following. This block performs freeze processing and removes index tuples that point to dead tuples. First, PostgreSQL scans a target table to build a list of dead tuples and freeze old tuples if possible. The list is stored in maintenance_work_mem in local memory. Freeze processing is described in Section 6.3. After scanning, PostgreSQL removes index tuples by referring to the dead tuple list. This process is internally called "cleanup stage". Needless to say, this process is costly. In version 10 or earlier, the cleanup stage is always executed. In version 11 or later, if the target index is B-tree, whether the cleanup stage is executed or not is decided by the configuration parameter vacuum_cleanup_index_scale_factor. See the description of this parameter in details. When maintenance_work_mem is full and scanning is incomplete, PostgreSQL proceeds to the next tasks, i.e. steps (4) to (7); then it goes back to step (3) and proceeds remainder scanning. Fig. 6.1. Removing a dead tuple. Assume that the table contains three pages. We focus on the 0th page (i.e. the first page). This page has three tuples. Tuple_2 is a dead tuple (Fig. 6.1(1)). In this case, PostgreSQL removes Tuple_2 and reorders the remaining tuples to repair fragmentation, and then updates both the FSM and VM of this page (Fig. 6.1(2)). PostgreSQL continues this process until the last page. Note that unnecessary line pointers are not removed and they will be reused in future. Because, if line pointers are removed, all index tuples of the associated indexes must be updated. The third block updates both the statistics and system catalogs related to vacuum processing for each target table. Moreover, if the last page has no tuples, it is truncated from the table file. When vacuum processing is complete, PostgreSQL updates both several statistics and system catalogs related to vacuum processing, and it removes unnecessary parts of the clog if possible (Section 6.4). Vacuum processing uses ring buffer, described in Section 8.5; thus, processed pages are not cached in the shared buffers. Vacuum processing is costly; thus, the VM was been introduced in version 8.4 to reduce this cost. The basic concept of the VM is simple. Each table has an individual visibility map that holds the visibility of each page in the table file. 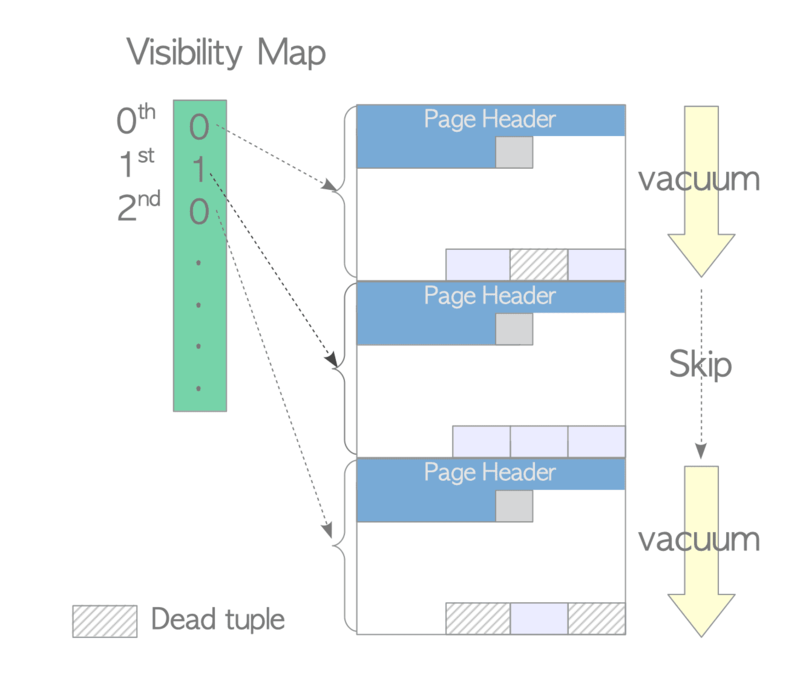 The visibility of pages determines whether each page has dead tuples. 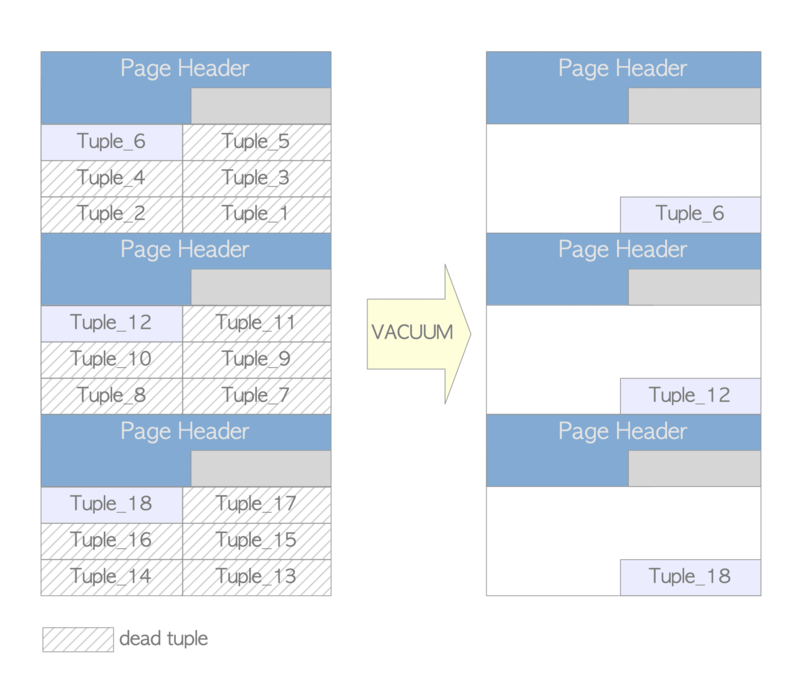 Vacuum processing can skip a page that does not have dead tuples. Figure 6.2 shows how the VM is used. Suppose that the table consists of three pages, and the 0th and 2nd pages contain dead tuples and the 1st page does not. The VM of this table holds information about which pages contain dead tuples. In this case, vacuum processing skips the 1st page by referring to the VM's information. Each VM is composed of one or more 8 KB pages, and this file is stored with the 'vm' suffix. As an example, one table file whose relfilenode is 18751 with FSM (18751_fsm) and VM (18751_vm) files shown in the following. Fig. 6.2. How the VM is used. The VM was enhanced in version 9.6 to improve the efficiency of freeze processing. The new VM shows page visibility and information about whether tuples are frozen or not in each page (Section 6.3.3). Freeze processing has two modes, and it is performed in either mode depending on certain conditions. For convenience, these modes are referred to as lazy mode and eager mode. Concurrent VACUUM is often called ‘lazy vacuum’ internally. However, the lazy mode, defined in this document, is a mode how freeze processing performs. Freeze processing typically runs in lazy mode; however, eager mode is run when specific conditions are satisfied. In lazy mode, freeze processing scans only pages that contain dead tuples using the respective VM of the target tables. In contrast, the eager mode scans all pages regardless of whether each page contains dead tuples or not, and it also updates system catalogs related to freeze processing and removes unnecessary parts of the clog if possible. Sections 6.3.1 and 6.3.2 describe these modes, respectively. Section 6.3.3 describes improving the freeze process in eager mode. When starting freeze processing, PostgreSQL calculates the freezeLimit txid and freezes tuples whose t_xmin is less than the freezeLimit txid. where \(\verb|OldestXmin|\) is the oldest txid among currently running transactions. For example, if three transactions (txids 100, 101, and 102) are running when the VACUUM command is executed, \(\verb|OldestXmin|\) is 100. If no other transactions exist, \(\verb|OldestXmin|\) is the txid that executes this VACUUM command. Here, vacuum_freeze_min_age is a configuration parameter (default 50,000,000). Figure 6.3 shows a specific example. Here, Table_1 consists of three pages, and each page has three tuples. When the VACUUM command is executed, the current txid is 50,002,500 and there are no other transactions. In this case, \(\verb|OldestXmin|\) is 50,002,500; thus, the freezeLimit txid is 2500. Freeze processing is executed as follows. Fig. 6.3. Freezing tuples in lazy mode. Three tuples are frozen because all t_xmin values are less than the freezeLimit txid. In addition, Tuple_1 is removed in this vacuum process due to a dead tuple. This page is skipped by referring to the VM. Tuple_7 and Tuple_8 are frozen; Tuple_7 is removed. Before completing the vacuum process, the statistics related to vacuuming are updated, e.g. pg_stat_all_tables' n_live_tup, n_dead_tup, last_vacuum, vacuum_count, etc. As shown in the above example, the lazy mode might not be able to freeze tuples completely because it can skip pages. The eager mode compensates for the defect of the lazy mode. It scans all pages to inspect all tuples in tables, updates relevant system catalogs, and removes unnecessary files and pages of the clog if possible. The eager mode is performed when the following condition is satisfied. In the condition above, pg_database.datfrozenxid represents the columns of the pg_database system catalog and holds the oldest frozen txid for each database. Details are described later; thus, we assume that the value of all pg_database.datfrozenxid are 1821 (which is the initial value just after installation of a new database cluster in version 9.5). Vacuum_freeze_table_age is a configuration parameter (default 150,000,000). Figure 6.4 shows a specific example. In Table_1, both Tuple_1 and Tuple_7 have been removed. Tuple_10 and Tuple_11 have been inserted into the 2nd page. When the VACUUM command is executed, the current txid is 150,002,000, and there are no other transactions. Thus, OldestXmin is 150,002,000 and the freezeLimit txid is 100,002,000. In this case, the above condition is satisfied because '\(1821 < (150002000 - 150000000)\)'; therefore, the freeze processing performs in eager mode as follows. Fig. 6.4. Freezing old tuples in eager mode (version 9.5 or earlier). Tuple_2 and Tuple_3 have been checked even though all tuples have been frozen. Three tuples in this page have been frozen because all t_xmin values are less than the freezeLimit txid. Note that this page is skipped in lazy mode. Tuple_10 has been frozen. Tuple_11 has not. After freezing each table, the pg_class.relfrozenxid of the target table is updated. The pg_class is a system catalog, and each pg_class.relfrozenxid column holds the latest frozen xid of the corresponding table. In this example, Table_1's pg_class.relfrozenxid is updated to the current freezeLimit txid (i.e. 100,002,000), which means that all tuples whose t_xmin is less than 100,002,000 in Table_1 are frozen. Before completing the vacuum process, pg_database.datfrozenxid is updated if necessary. Each pg_database.datfrozenxid column holds the minimum pg_class.relfrozenxid in the corresponding database. For example, if only Table_1 is frozen in eager mode, the pg_database.datfrozenxid of this database is not updated because the pg_class.relfrozenxid of other relations (both other tables and system catalogs that can be seen from the current database) have not been changed (Fig. 6.5(1)). If all relations in the current database are frozen in eager mode, the pg_database.datfrozenxid of the database is updated because all relations' pg_class.relfrozenxid for this database are updated to the current freezeLimit txid (Fig. 6.5(2)). Fig. 6.5. Relationship between pg_database.datfrozenxid and pg_class.relfrozenxid(s). 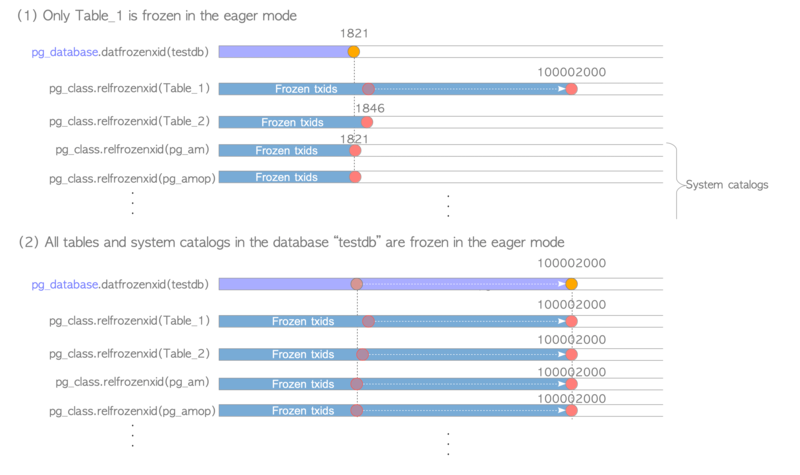 In the following, the first query shows the relfrozenxids of all visible relations in the ‘testdb’ database, and the second query shows the pg_database.datfrozenxld of the ‘testdb’ database. The VACUUM command with the FREEZE option forces all txids in the specified tables to be frozen. This is performed in eager mode; however, the freezeLimit is set to OldestXmin (not ‘OldestXmin - vacuum_freeze_min_age’). For example, when the VACUUM FULL command is executed by txid 5000 and there are no other running transactions, OldesXmin is set to 5000 and txids that are less than 5000 are frozen. The eager mode in version 9.5 or earlier versions is not efficient because always scans all pages. For instance, in the example of Section 6.3.2, the 0th page is scanned even though all tuples in its page are frozen. To deal with this issue, the VM and freeze process have been improved in version 9.6. As mentioned in Section 6.2.1, the new VM has information about whether all tuples are frozen in each page. When freeze processing is executed in eager mode, pages that contain only frozen tuples can be skipped. Figure 6.6 shows an example. When freezing this table, the 0th page is skipped by referring to the VM's information. After freezing the 1st page, associated VM information is updated because all tuples of this page have been frozen. Fig. 6.6. Freezing old tuples in eager mode (version 9.6 or later). The clog, described in Section 5.4, stores transaction states. When pg_database.datfrozenxid is updated, PostgreSQL attempts to remove unnecessary clog files. Note that corresponding clog pages are also removed. Figure 6.7 shows an example. If the minimum pg_database.datfrozenxid is contained in the clog file '0002', the older files ('0000' and '0001') can be removed because all transactions stored in those files can be treated as frozen txids in the whole database cluster. Fig. 6.7. Removing unnecessary clog files and pages. $ psql testdb -c "SELECT datname, datfrozenxid FROM pg_database"
$ ls -la -h data/pg_clog/	# In version 10 or later, "ls -la -h data/pg_xact/"
drwx------  2 postgres postgres   28 Dec 29 17:15 .
drwx------ 20 postgres postgres 4.0K Dec 29 17:13 .. Vacuum processing has been automated with the autovacuum daemon; thus, the operation of PostgreSQL has become extremely easy. The autovacuum daemon periodically invokes several autovacuum_worker processes. By default, it wakes every 1 min (defined by autovacuum_naptime), and invokes three workers (defined by autovacuum_max_works). The autovacuum workers invoked by the autovacuum perform vacuum processing concurrently for respective tables gradually with minimal impact on database activity. Refer to "Tuning Autovacuum in PostgreSQL and Autovacuum Internals". Although Concurrent VACUUM is essential for operation, it is not sufficient. For example, it cannot reduce table size even if many dead tuples are removed. Fig. 6.8. An example showing the disadvantages of (concurrent) VACUUM. The dead tuples are removed; however, the table size is not reduced. This is both a waste of disk space and has a negative impact on database performance. For instance, in the above example, when three tuples in the table are read, three pages must be loaded from disk. To deal with this situation, PostgreSQL provides the Full VACUUM mode. Figure 6.9 shows an outline of this mode. Fig. 6.9. Outline of Full VACUUM mode. When the VACUUM FULL command is executed for a table, PostgreSQL first acquires the AccessExclusiveLock lock for the table and creates a new table file whose size is 8 KB. The AccessExclusiveLock lock does not allow access. PostgreSQL copies only live tuples within the old table file to the new table. After copying all live tuples, PostgreSQL removes the old file, rebuilds all associated table indexes, updates both the FSM and VM of this table, and updates associated statistics and system catalogs. Two points should be considered when using the VACUUM FULL command. Nobody can access(read/write) the table when Full VACUUM is processing. At most twice the disk space of the table is used temporarily; therefore, it is necessary to check the remaining disk capacity when a huge table is processed. When should I do VACUUM FULL? There is unfortunately no best practice when you should execute ‘VACUUM FULL’. However, the extension pg_freespacemap may give you good suggestions. The following query shows the average freespace ratio of the table you want to know. round(100 * avg(avail)/8192 ,2) as "Av. freespace ratio"
As the result above, You can find that there are few free spaces. If you delete almost tuples and execute VACUUM command, you can find that almost pages are spaces ones. The following query inspects the freespace ratio of each page of the specified table. testdb=# SELECT *, round(100 * avail/8192 ,2) as "freespace ratio"
After executing VACUUM FULL, you can find that the table file has been compacted.